NB - this needs editing. In the summer of 2017 I was made aware by concerned residents, that an archaeological dig was in progress on the area which has been called the Maylands Gateway development. One of the residents visited the dig whilst it was on-going and took some photos of her own as well as talking to the archaeologists about their finds, which turned out to be Roman. When I heard this, knowing of the important find of a Roman Mausoleum by Dr. David S. Neal almost adjacent to the site, I alerted members of HHLH&MS and Dr. David Neal. Dr. Neal paid a visit and was very interested in what they had found. Roman Denarius found at the Maylands Gateway Dig 2017. Photograph © Oxford Archaeology & reproduced with their permission. 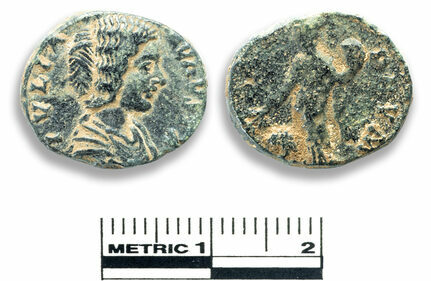 It is a denarius of Julia Domna (the wife of Septimius Severus). She was Augusta (empress) from 193-217. This coin is dated AD 198.